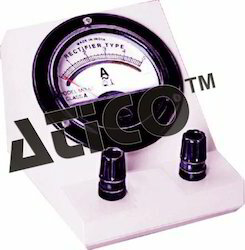 Pioneers in the industry, we offer round panel meter d.c a grade model mo-65 (without stand), meter desk stand, double scale meter model, a.c. moving coil meter model mo-65, rectangular panel meter model mr-100 (without stand) and d.c. galvanometer model mr-100 (without stand) from India. Over all size of the bakelite panel is about 82 mm dia with dial of about 57 mm dia. Scale length is about 47_mm + 2mm. Accuracy ±1.5% F.S.D. with anti parallax mirror but without desk stand. 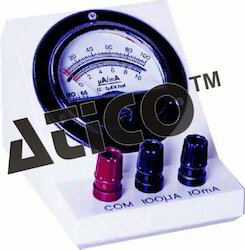 b) D.C. Ammeter 10,15 Amps. c) D.C. Ammeter 20,25,30 Amps. All ABS moulded (unbreakable) in conveniently inclined face fitted with two heavy lock type terminals and heavy Lead wires. From Bottom side it is closed with unbreakable plastic plate. 1.5/3, 7.5/15, 15/30, 30/60 V or 1.5/30V. A' grade panel meter of overall size 82mm dia (Model MO- 65) mounted in beautiful deluxe desk stand, hand calibrated accuracy1.5% F.S.D. 0-1, 1.5, 2.5, 3,5, 10 Amp. •Fitted at front with zero adjuster. •Knife edge pointer with anti parallax mirror for accurate readings. 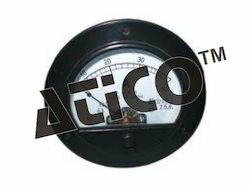 •The slanting front of meter inclines the 45º scale permitting of it to be read with equal ease from eye level also. •Acrylic Meters may be subjected to wide variations in temperature or remain in the circuit continuously without seriously affecting the accuracy. 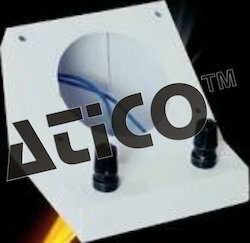 • Allacrylic meters are manufacturedand calibrated in a modern air-conditioned and state-of-the-art plant which has been designed and built speciallyfor this work. These meters are guaranteed to perform satisfactorily All.our MR-100 meters are provided with anti-parallax mirror but without deskstand. D.C. Ammeter 1, 1.5,2.5,3.5 Amps. 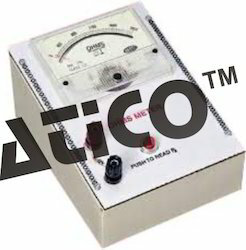 D.C. Ammeter 20, 25, 30 Amps. It is widely used because it is very compact, economical and user friendly, with dial reading 30-0-30 or 50-0-50 (available with different sensitivities) .The portability, rugged construction, large clear scale & economically priced galvanometer is ideal for student's experiment. Its sensitivity of 20uA/div. is particularly suitable for slide wire bridges, potentiometers & experiments on induced e.m.f. 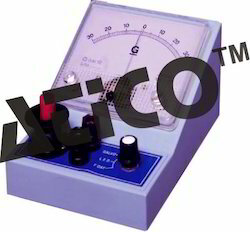 Galvanometer with different sensitivities are listed in the table. Supplied without stand. Meter Desk stand for Model MR-100, non breakable stand moulded from first quality ABS heavy type, fitted with very fine quality (highly insulated) locked type terminals. Extra ordinary superior quality. The almost universal use of Alternating Current (A.C.) in electric power transmission and consumption suggests that more time should be devoted to teaching the principles of A.C. in elementary physics. Student interest quickens when the practical advantage of A.C are shown. 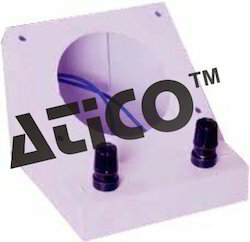 A.C. Acrylic meters for teaching and are especially suitable for use by students. These are economical, ruggedly constructed, have ample precision and are available in all commonly needed ranges. 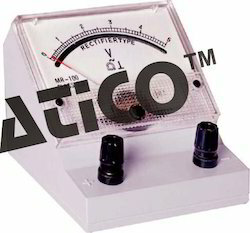 All our A.C. Rectangular panel meters are provided with stands. 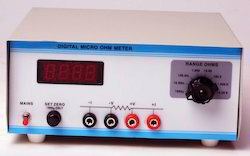 Ohm Meter is designed for measuring the resistance in electronics circuits. 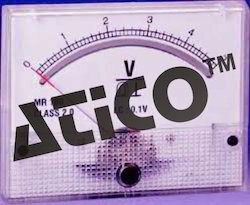 The MR-100 model meter is used for ohm meter. The chasis is made from thick steel sheet with Aluminium top. The dry battery cell is fixed to chassis from the bottom side with the help of perspex sheet. The dry cell can easily be replaced by removing two steel screws. Range 1 µΩ to 19.99Ω in 5 decimal ranges. Range 1 µΩ to 19.99 KΩ in 8 decimal ranges. Range 1 µΩ to 19.999 KΩ in 8 decimal ranges. Student can perform two different experiments of Faradays Law by using the selector switch.How induced emf is by the moving a magnet in/out of a coil With the galvanometer and the second is with LED's. Kitis provided with a coil copper wire, LED'S, bar magnet and deluxe model meter MR- on stand. Applications: Spot Galvanometer finds extensive use as a D.C. null detector in wheat stone bridges and potentiometers. Mains feed:It is a' mains' operated instrument but can operate on a 6 volt battery also. There is provision to operate this instrument can be operated on both as well as main supply 220 volts, 50Hz or 6 Volt Capacity. Light Source:The light Source is 6 Volt and 0.3Amp bulb giving a bright spot on the scale. 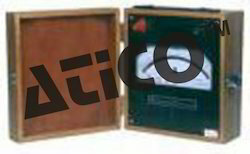 Construction: The galvanometer has built in lamp and scale arrangement and housed in a bakelite case.The highly sensitive moving coil system is suspended in a taut band manner in a uniform field of permanent magnet. Scale:The scale is 150mm long and end zero use. Zero Adjustment: The spot of light can be set at any point on the scale with the help of zero adjusting knob. 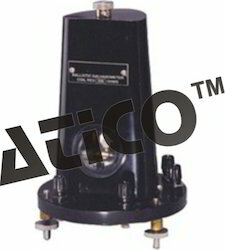 - These galvanometer are rigid in construction beautiful in design and easy to operate, with large periodic time. - Large moment of Inertia of the moving part of the galvanometer. - Ballistic Galvanometers undergo strict laboratory check before dispatch and are suitable for direct deflection measurements which are closely proportional to the current. 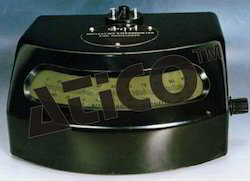 - These galvanometers can be used both PERIODIC as well as APERIODIC instruments. - An arrangement is providedto make it APERIODIC by introducing a suitable resistance in parallel with the moving coil system. - Zero adjusting and locking devices are provided.ThePhosphor-bronze suspension strip prevents shifting of zero. - The moving coil carries a specially polished front silvering concave mirror of 100cm. focal length, suitable for use with Lamp and Scale Arrangement. Galvanometer Resistance 100 Ohms and Time period Approximate 10-12 Seconds. Galvanometer Resistance 500 ohms and Time period Approximate 10-12 Seconds. 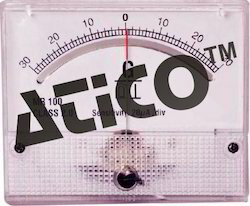 Looking for Meters Ballastics And Spot Galvanometer ?